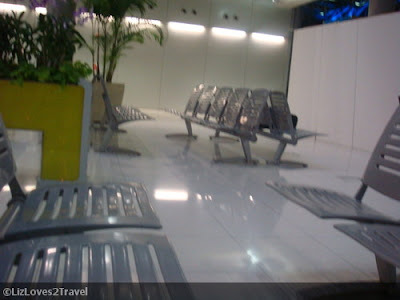 Last year, I decided to join a Backpacking Indochina trip with Travel Factor. First, I thought I'm going to be alone. Second, I found it "cheap". Third, it seemed more convenient for me to just pay then just pack my bags on the day of departure. But then, after doing some research I found out that it will be way cheaper if I'm going to do it by myself. So I started to plan my own itinerary but the plane tickets I had were the same flights as theirs. They became my plane mates in short haha. A few weeks before the trip, my travel partner said he can join me. But he can't leave on the same day I was because he still have to go to work. He flew out the following day after my departure. 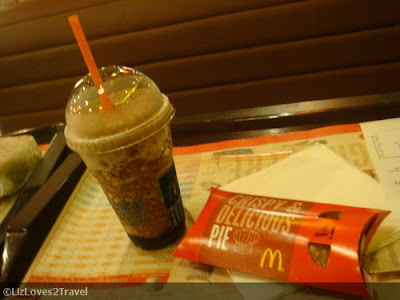 So, for the first time, I was going out of the country solo. 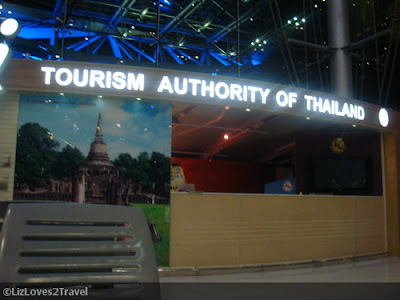 After a 2 or 3 hours flight delay, we touched down to Suvarnabhumi Airport. Gosh, it was already 3:00 AM when we arrived. I was so groggy that I didn't take as many photos as I would if I'm feeling alive. When I'm done with the immigration and customs, I exchanged some money. Since it was a wee hour and I was a lone female, I did not take the risk of commuting to the city. That time I just wanted to sleep. I slept for about an hour in one of the benches in third floor. But the aircon there was so freaking cold and I was always awaken by people going to the wrong escalator. Those freaking escalators there were confusing and it beeps every time you're using the incorrect one. By the way, sleeping travelers is a common sight in Suvarnabhumi. Others were so prepared they have sleeping bags and blankets. I went down to the ground floor to look for another place to sleep. I found myself in front of the TAT counter. The place was deserted that only a few people were sleeping in the area. I think there were only four of us there. I was able to sleep a couple more hours. After refreshing myself in the restroom, I just bought something to munch on, then left. Airport Express Bus' operations has been canceled already so I looked for the bus that would take me to the Terminal going to the city proper. I guess they're not treating me like a tourist because we also looked like them and I was alone. So I pretended I am familiar with all the sights but I was actually observing if I rode the correct bus haha. I apparently did. The last stop was the Terminal. I was looking for the Bus Number that I'm supposed to get into but there's none. I asked a few people but they couldn't understand me. Waaahh! 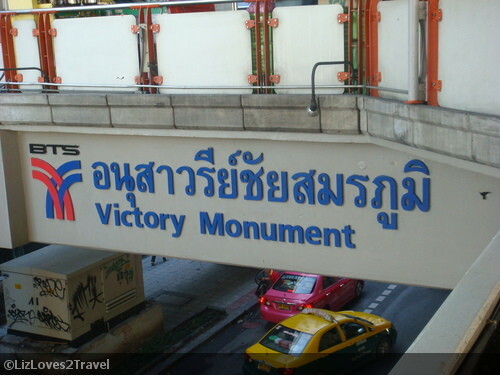 Good thing, there was a van (like GT Express here) going to Victory Monument. I asked the driver how much the fare is and hopped in. After about an hour, the driver dropped me off. 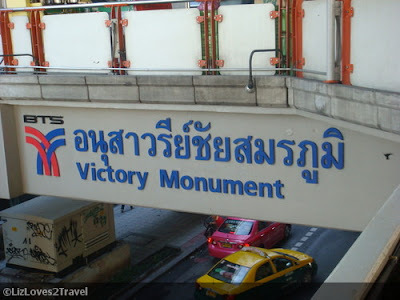 I felt so victorious seeing the Victory Monument haha. I went to the nearest 7Eleven Store to buy a Thai sim card. My Globe roaming request did not go through argh! Outside, I asked some vendors to tell me where the BTS station is. I was so glad and thankful that even though they can't speak English, they were helpful enough to point me to the right direction. Oh yes, I found the BTS station hehe. Now I'm just a train ride away to my hotel. It was still early when I got to the hotel. It was eightish I guess. I was so relieved that I can already check-in despite of my very early arrival. Maybe there were only a few guests because it was the height of the Thailand flooding. I took a shower and had coffee. I didn't want to sleep because I knew if I do, my whole day will be wasted in bed. I also ate the bread I got from the airport the other night. 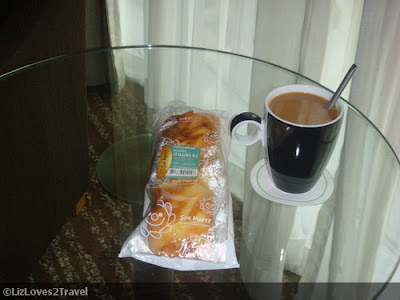 It was like the pork floss bread from Bread Talk hehe. It was good. It was too early to go out so I rested for about two hours. I really tried not to go to sleep. 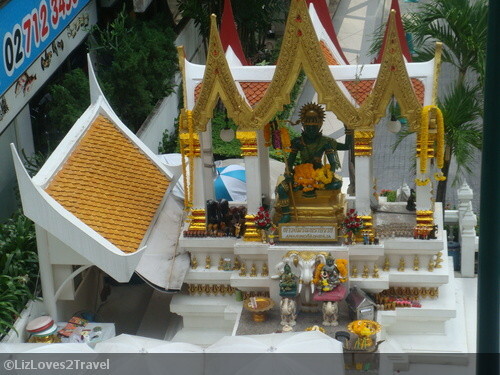 I took a walk around the Siam area at around 10:00 AM. It is just walking distance from my hotel. 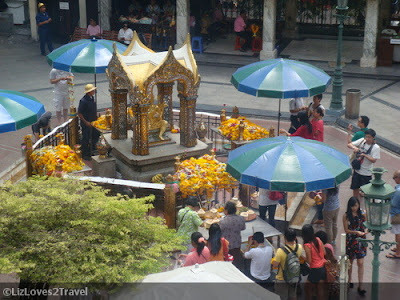 I passed by Erawan Shrine on my way there. 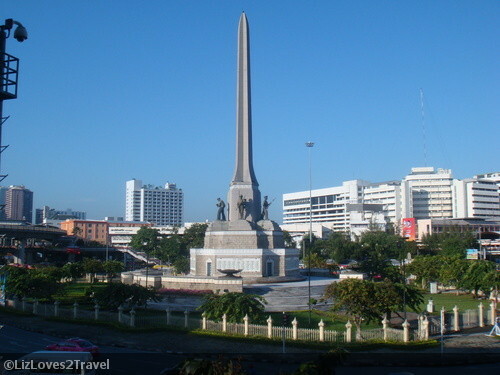 I just took a photo from where I was (train station skyway). 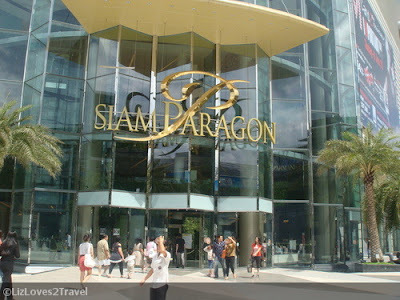 A few more minutes later, I reached the Siam Paragon. It has Discovery Center and Ocean World inside. It also has IMAX theaters like what we have in Mall of Asia. 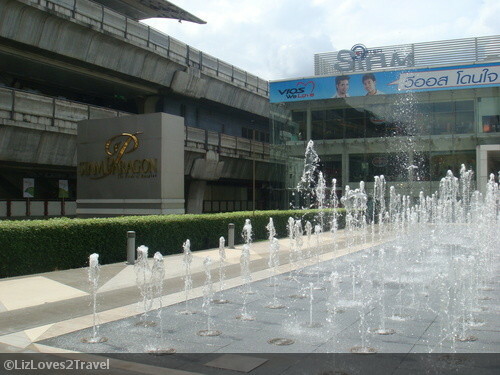 I guess it is one of the biggest malls that they have in Bangkok. I entered the mall and check out some shops. The items are expensive. Even their department store sells premium items. I'm not going to buy anything there haha. 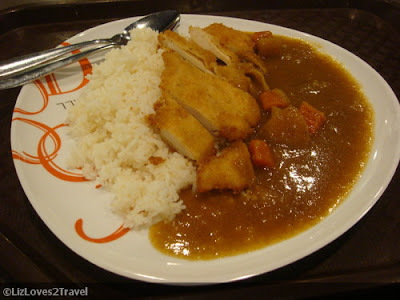 When I had enough of window shopping, I went down to the food court for lunch. I had chicken in brown curry sauce. As expected, Thai dish is delish! A Thai woman shared the table with me. I just nodded and smiled even though I didn't understand the words she said haha. I really felt tired sooner. Maybe because I did not have a comfortable and enough sleep the other night. I no longer went to the National Stadium and Jim Thompson House. I walked on the actual road back and noticed some government structures along the road. 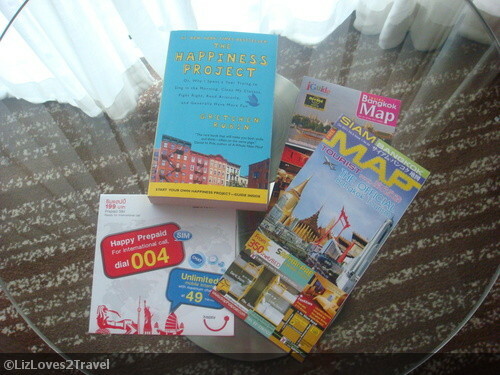 I dropped by to Amarin Plaza and bought some souvenir items. Unlike Paragon, there are tiangge-like stores in there that sells cheap items. When I got to my hotel room, my body gave in. I accepted the invitation of the bed and the pillows for me to sleep. It was almost 12:00 AM when my company arrived. We immediately went out and ate at McDonalds across the street. 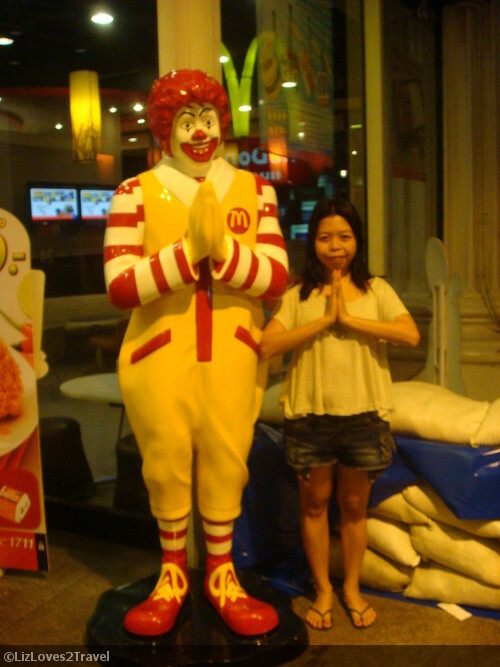 Took a picture with Ronald outside. If you noticed the pile of sandbags, it was their precautionary measure in case the flood in the city got worse. We hurried back to the hotel after filling our tummy. We were leaving in the morning for Khao San and to explore the Rattanakosin area. This is Part 1 of my Bangkok travel series.